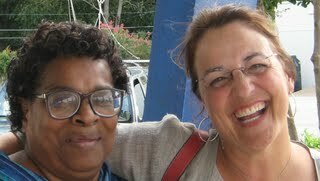 New friends & Two by Two Prayer Partners (Beverly Lewis, left and Nancy Holcomb, right) sat with me recently at Memphis Pizza Cafe and shared about how HOPE broke into two very hopeless situations. Through tears Beverly shared of a former life as a crack and alcohol addict (with five kids to raise on her own & no help but a small welfare check). She felt hopeless for sure, but there was something that kept drawing her back to a small church in New York City. It was there that HOPE finally got a hold of her (HOPE found in the person of Jesus) and her smile is proof that she will never be the same! Nancy with a totally different story of hopelessness, lost her precious son Jay after a 14 year battle with spinal bifida. One can only imagine the devastation of a mother who loses a child. Yet after her own battle through more physical and emotional struggle than I have room to share here.... HOPE rushed in and saw Nancy through. She would tell anyone that Jesus is her HOPE, life is not easy but He who promised is faithful and He will hold you secure! Nancy and Beverly laugh at how out of the box God was to bring them together. They've truly come to love one another as they've prayed for Memphis and for each other. Originally Beverly thought to herself - She ain't like you! But as their hearts have connected in prayer, they've realized how much they have in common. Despite our differences, despite our pain, there is HOPE and His name is Jesus! Two by Two at the Pyramid!